Yet another calendar year gone by. In terms of cycling, rather unremarkable with a few notable exceptions. 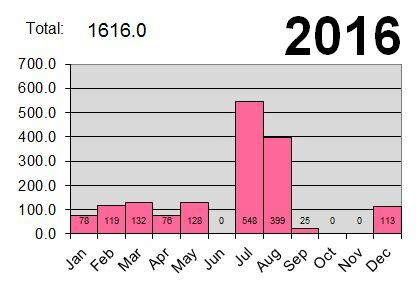 A long steady decline in mileage year on year. One might be tempted to chalk that up to age or interest, but mostly life getting in the way. Took some huge breaks in there due to conflicting travel. 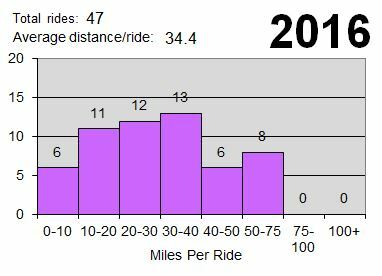 Aaverage distance per ride is staying pretty steady, just a drop in number of days doing it. Two “regular” rides predominated. Several dozen 26 mile round trip rides to meet Jesse for breakfast. 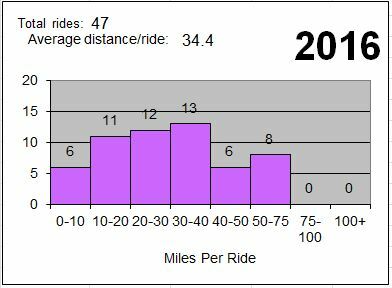 And another dozen 22 mile rides to visit my orthodontist. Training rides, almost always a 55 mile loop up Bush Highway with a return on the Beeline. Highlight of the year: Our Upper Mississippi Tour – RAGBRAI XLIV, with an additional week of independent touring on the Mississippi River to Minneapolis. Capped off the year with a December 29 ride with my future son-in-law up by Saguaro Lake. Bring on 2017. Jack and I are already conferring on possible tours, although like me, life keeps getting in his way. Hope we can get something organized. Like Jack says, “Start skipping bike trips and the next thing you know, we’re old…” Yep.